We have been publishing several articles and case studies about predictive and preventive maintenance, which is very closely connected to bearing reliability and the current state of various new technologies. In the coming years, echnological developments are expected to reshape the industrial environement at fast pace. The evolution of the Internet of Things, industrie 4.0, machine learning and the revolution in the automotive industry will define the future of the manufacturing industry; and makes further changes inevitable for the bearing engineering, manufacturing, distribution and maintenance as well. Each time some technological development emerges, the industry involved must adapt to make the best use of it. That can be particularly difficult in the industrial setting, often driven by the mantra, “If it’s not broken, don’t fix it.”. Maintenance is no longer a guessing game and companies now know in advance when a system will or can fail and take necessary measures to avoid failures and optimize the efficiency of thier assets. The ability to monitor the condition of bearings 24/7, from any location, is becoming the new trend in maintenance practices. Bearing condition monitoring by ultrasound will play a key role in this trend. You will be able to read various articles in this issue which will help you gain more insight in the latest trends for condition monitoring, ultrasound, lubrication optimization and other subject that can help avoid system failures. 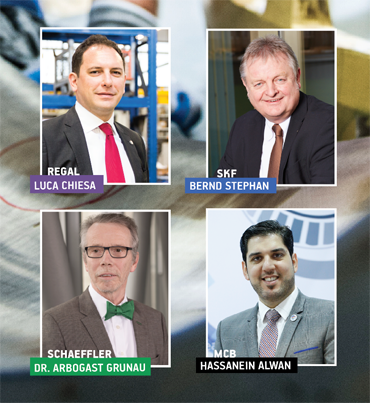 Further in this issue, we have ‘a BearingNEWS classic’: four exclusive interviews with the leaders of important production and distribution organizations in the bearing and related industries. The first interview is with Mr. Luca Chiesa, Managing Director of Cemp Motors, a Regal brand and leading manufacturer of electric motors for the global industrial market and specialized in motors for hazardous atmospheres. The second interview is with Dr. Arbogast Grunau, who is in charge of Corporate R&D Competence and Services at Schaeffler AG in Germany. We tried to reveal why Schaeffler is sponsoring the Bearing World Conference and had the chance to discuss Schaeffler’s presentation topics about the development of a new asymmetrical spherical roller bearing for wind turbine applications and the prediction of bearing noise. SKF is also one of the main sponsors and supporters of the Bearing World conference, and sees it as a leading event to exchange state of the art technology and latest research results, in order to make machines more powerful and more reliable. We tried to reveal why SKF, one of the global bearing suppliers and leading company in bearing research and technology, is sponsoring the Bearing World Conference, during an interview with Mr. Bernd Stephan, President Automotive & Aerospace at AB SKF. Mineral Circle Bearings is the first company in the UAE who specializes in automotive bearings, making it one of the top aftermarket institutions in the region. For more than 30 years, MCB has served as the preferred supplier of a wide range of quality and cost effective brands for automotive, industrial or agricultural bearings, cv joints, universal joints, grease, tools, as well as oil seals from leading manufacturers. We tried to find out the story behind the company during an interview with Mr. Hassanein Alwan, the Managing Director at Mineral Circles Bearings. What’s rolling in the bearing industry? A brief summary of what happened during the last six months in the bearing industry; preparation and approach to Bearing Damage Analysis, rollingcontact fatigue and wear testing, new production technologies, preparation and approach to bearing damage analysis, new products releases, the importance of bearing selection on gearbox performance, a new volume of top 100 bearing reliability tips from Per Arnold Elgqvist, and what you need to know if you’re buying bearings from China… Together with all these interesting topics, many other bearing industry related articles, case studies, insights and developments can be discovered in this February issue of the BearingNEWS magazine. 150 pages full of BearingNEWS. We hope that you will enjoy it! Distributor companies who are member of BearingCLOUD are receiving automatically all the printed BearingNEWS magazine and newsletters at their address.